A dock landing ship (often formally designated as a landing ship, dock, or LSD) is an amphibious warfare ship incorporating a docking well into the stern for the accommodation, transport, and launch/recovery of landing craft and amphibious vehicles. Some ships with docking wells, such as those of the Soviet/Russian ‘Ivan Rogov’ class, also have bow doors akin to those of the tank landing ship (LST), enabling them to deliver vehicles directly onto a beach. Modern LSDs can also carry and operate helicopters. A ship with a docking well is better suited to the loading of landing craft with infantry and/or equipment in rough seas than a amphibious warfare ship, which has to depend on cranes or a stern ramp. 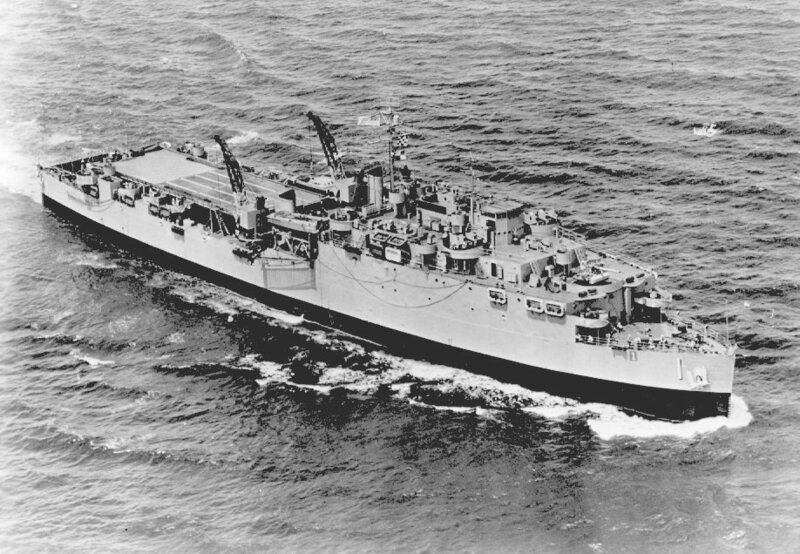 Based on US Navy practice, the modern standard nomenclature for a ship with a well deck depends on its aircraft facilities. The modern LSD has a helicopter deck, the LPD also has a hangar, and the LHD or LHA has a full-length flight deck. Though it remains a little-known fact, and bears no long-term significance, it was Japan which was the world’s first nation to design and build vessels specifically for the amphibious warfare role. The pioneer LSD was Shinshu Maru, which was designed to an army specification of 1932 to support operations in China, built by Harima between 8 April 1933 and 14 March 1934 for commissioning on 15 November 1934. Built on the lines of a whaling factory ship, Shinshu Maru marked a significant advance in amphibious warfare as she incorporated a number of innovative features, and as such she was shrouded in secrecy throughout her existence. In the lower part of her hull she could carry 29 ‘Daihatsu’ class landing craft, or 25 ‘Shohatsu’ class landing craft and four armoured gunboats, to be launched from a floodable docking well and sloping rear ramp otherwise closed to the sea by a pair of large doors. The provision of large ports in the sides of the ship made it possible for stores and equipment to be trans-loaded into landing craft waiting alongside, and a heavy crane and derricks were also fitted to assist with the handling of heavier items. The ship was sunk, possibly by the ‘friendly fire’ of the destroyer Fubuki in the Battle of the Sunda Strait on 1 March 1942, but was raised in 1943 and received a major upgrade as she was refitted. This upgrade revised the superstructure into a hangar large enough to accommodate six Mitsubishi Ki-30 light bombers and six Nakajima Type 91 fighters. There was no flight deck, but the the crane on the foredeck was replaced by a catapult to launch the aircraft, which had perforce to alight on land, preferably on a captured airfield. The ship was used for landing operations until 5 January 1945, when she was sunk by US air attack. Shinshu Maru’s data included standard and full-load displacements of 9,000 and 11,800 tons, length of 492 ft 1.5 in (150.0 m), beam of 72 ft 2 in (22.0 m), draught of 26 ft 9 in (8.16 m), propulsion by geared steam turbines delivering 8,000 shp (2440 kW) to two shafts for a speed of 19 kt, and armament of four to eight 75-mm (2.95-in) Type 88 anti-aircraft guns and eight to 12 20-mm cannon. The modern concept of the LSD was spurred by the British, who needed a fully optimised vessel for the carriage and launch of large landing craft across the seas at speed on longer-range commando operations. Originating in 1941, the first LSD came from a design by Sir Roland Baker who had designed the British tank landing craft (LCT), and provided a solution to the problem of launching small craft rapidly. The initial results were the single Landing Ship, Stern Chute, which was a converted train ferry with accommodation for 105 troops and 50 vehicles, and fitted with a stern chute down which mechanised landing craft (13 LCM Mk 1 or nine LCM Mk 3) could be launched; the three Landing Ships, Gantry, which were converted tankers each with accommodation for about 260 troops and fitted with a crane to transfer its cargo of landing craft (15 LCMs ) from deck to sea in a little more than 30 minutes; and two Landing Ships, Carrier (LSC), which were heavy cargo ships with accommodation for 323 troops and fitted with large derricks to handle as many as 21 LCMs carried as deck cargo. These interim designs paved the way to the first thoughts leading directly to the LSD. These were originated from the winter of 1941 by the Admiralty Construction Department as a vessel to be used as a mobile floating dock ship which could take a single LCT on longer passages for possible raids beyond the LCT’s range. This requirement had been outlined in September 1941, and the Admiralty design for this LSD was sent to the USA, where the Bureau of Ships and subsequently the naval architect Gibbs & Cox of New York developed the type for construction in US yards. The principle of flooding the LSD’s cargo spaces to float off smaller craft and the use of specially trained civilian floating dock crews was thought too complex for general service personnel of the Royal Navy to attempt. There were many problems to be overcome, but the Department of Naval Construction overcame these with an arrangement of machinery that worked satisfactorily, although the buoyancy of engine room and other machinery spaces meant that tanks above the waterline as well as those below it had to be filled when the ship was being lowered so that the doors could be opened and the docking well flooded. Flooding-down took only 90 minutes and could be undertaken even with the ship steaming at slow speed, and the pumping out of the docking well and closure of the doors took 150 minutes to restore the ship to normal cruising trim. The docking well measured 394 ft (120.1 m) in length and 44 ft (13.4 m) in width, and was flooded to allow amphibious craft and vehicles as large as LCTs and Infantry Landing Craft, Large (LCI[L]s) to motor out when the stern doors were opened. The dangers from seas washing around this area, making the half-submerged ship unmanageable, were prevented by lock-gates fitted amidships, but these were taken out after some months. The first LSDs went into service in 1943: 27 were built for the US Navy as the ‘Ashland’ class and seven were ordered for the Royal Navy, although the latter received only four (Eastway, Highway, Northway and Oceanway). In addition to accommodation for landing craft crews and cargo-handling personnel, the LSD had workshops for the repair of the metalwork and woodwork of minor craft, and could be used to repair LCI(L)s, PT-boats and similar craft. When flooded, the dock had a depth of 8 ft (2.4 m) forward sloping to 10 ft (3.05 m) aft. Two temporary decks could be installed above the dock pontoon, and LVTs or DUKWs could be loaded onto these by the ship’s pair of 35-ton cranes. The additional decks had a ramp extending to the stern, and on the US Navy’s later ships an inboard travelling crane was fitted to facilitate the installation of these removable decks. These ‘Ashland’ class LSDs were built by five yards in two basic forms, the first 12 with two Skinner Uni-Flow reciprocating engines delivering 7,400 ihp (5517 kW) and the last 15 with geared steam turbines delivering 9,000 shp (6710 kW), each in each two two shafts for speeds of 15.4 and 15.6 kt respectively. The other data included light and loaded displacements of 4,032 and 7,930 tons respectively, length of 457 ft 9 in (139.5 m), beam of 72 ft 2 in (22.0 m), draught of 15 ft 5.5 in (4.7 m) forward and 16 ft 2 in (4.9 m) aft when loaded, endurance of 9,200 miles (14805 km) 15 kt, armament of one 5-in (127-mm) gun, two quadruple 40-mm anti-aircraft guns, two twin 40-mm anti-aircraft guns, and 16 20-mm anti-aircraft cannon, crew of 290 men, and capacity of 240 men, and payload of three LCT Mk 5s or Mk 6s, or two LCT Mk 3s or Mk 4s, or 14 LCM Mk 3s, or 1,500 tons of cargo, or 41 LVT amphibious tractors or 47 DUKW amphibious trucks.